Either way, it’s time for a margarita. Wrong season, I know. But that’s the point. You might have record-breaking cold and snow outside… but inside, instant beach party! Plus, I’ve been in Tucson visiting family recently. Every time I go, I feel compelled to have at least one margarita—usually prickly pear. In spite of the name, prickly pears have nothing to do with “pears” as you know them, and everything to do with “prickly.” It’s a type of cactus that’s plentiful all over the southwest. Both the prickly pear cactus itself and its fruit are edible (but if you don’t know what you’re doing, you may not want to try it at home). They’re high in fiber and full of flavonoids. After centuries of use in Native American food and drinks, the prickly pear cactus has more recently found its way into Western cuisine. This particular recipe calls for prickly pear juice. You can also substitute prickly pear syrup, which is more commonly used. The latter is less expensive and easier to find. It’s also a little sweeter. And it helps give prickly pear margaritas their hot pink hue. That’s another thing I love about this drink. 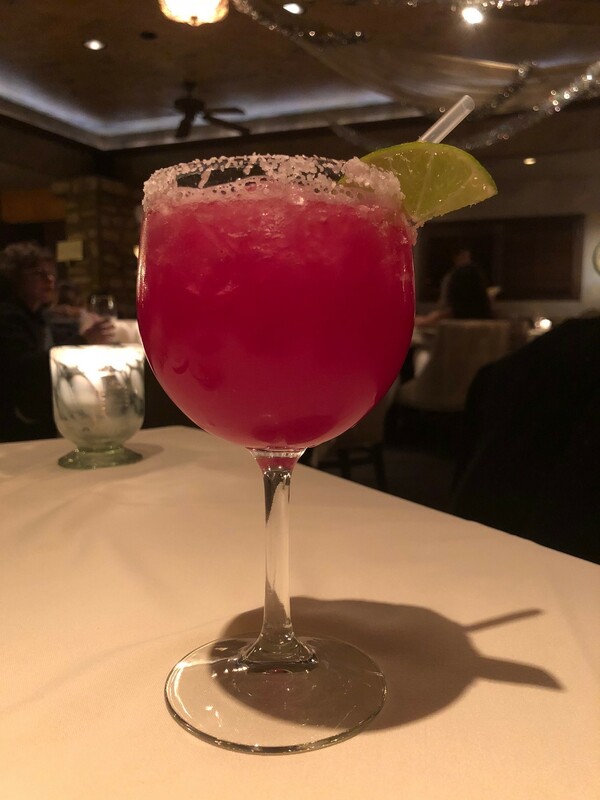 It looks so bright and cheerful, but like any other margarita, it’s got some bite to it. After boozing it up in December, more people every year are deciding to observe Dry January. As in, no drinking for the month. It’s been popular in the UK for a long time, where alcohol abuse is a major cause of death for people aged 15 to 49. And the results are pretty impressive. 49% of people who do Dry January lose weight, and 62% sleep better. I’m not here to tell you not to drink. That’s up to you (I’m not doing Dry January, myself). But whether you do or don’t, you should be able to enjoy a margarita either way. And because not everyone will be into prickly pear margaritas, the virgin recipe is more traditional. So here you go – recipes for a cocktail and a mocktail. Wet the rim of your glass with a dab of lime juice and coat with salt. Combine the liquid ingredients in a shaker with ice. Strain into your glass and garnish with lime. Combine all the liquids with ice in a shaker. Strain the juice into your glass and garnish with lime. If you prefer a frozen margarita, blend the juices in a blender with ¾ of a cup of ice instead of shaking. PS – I take requests for both the drink of the month and the recipes page. If there’s something you’d like a recipe for, let me know at @cocktailspy (Twitter and Instagram), post them on the CocktailSpy.com Facebook page, or email them to thecocktailspy[at]gmail.com.